Updated with weather warnings and advisories for the viewing area. * WHAT...Snow occurring. Plan on difficult travel conditions including reduced visibility from falling and blowing snow. Additional snow accumulations of 3 to 5 inches are expected. * WHERE...Portions of west central into north central Iowa. * ADDITIONAL DETAILS...Winds gusting as high as 40 mph will cause widespread blowing and drifting snow with visibility reduction below one half mile common on Thursday morning. Cold wind chills of 10 to 20 below may cause frostbite in as little as 30 minutes. PRECAUTIONARY/PREPAREDNESS ACTIONS... A Winter Storm Warning for snow means severe winter weather conditions are occurring. If you must travel, keep an extra flashlight, food and water in your vehicle in case of an emergency. The latest road conditions for the state you are calling from can be obtained by calling 5 1 1. * WHAT...Snow and blowing snow occurring. Plan on slippery road conditions, including during the evening commute. In addition, areas of poor visibility are expected. Additional snow accumulations of 2 to 4 inches are expected. 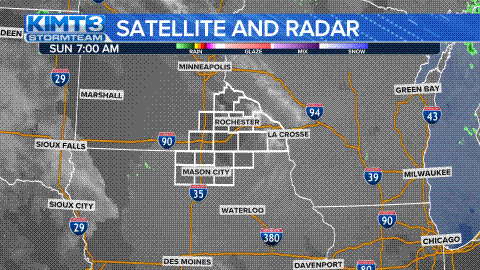 * WHERE...Portions of northeast Iowa, southeast Minnesota, and western and north central Wisconsin. * ADDITIONAL DETAILS...Winds gusting as high as 35 mph will cause areas of blowing and drifting snow, especially on ridge tops and in open areas. PRECAUTIONARY/PREPAREDNESS ACTIONS... A Winter Weather Advisory for snow and blowing snow means periods of snow and blowing snow will cause primarily travel difficulties. Be prepared for snow covered roads and limited visibilities, and use caution while driving. The latest road conditions for the state you are calling from can be obtained by calling 5 1 1. * WHAT...Snow occurring. Plan on slippery road conditions. Additional snow accumulations of up to two inches are expected. * ADDITIONAL DETAILS...Winds gusting as high as 40 mph will cause widespread blowing and drifting snow. Cold wind chills as low as 20 below zero will cause frostbite in as little as 30 minutes to exposed skin. PRECAUTIONARY/PREPAREDNESS ACTIONS... A Winter Weather Advisory for snow means periods of snow will cause primarily travel difficulties. Be prepared for snow covered roads and limited visibilities, and use caution while driving. The latest road conditions for the state you are calling from can be obtained by calling 5 1 1. * WHAT...Freezing drizzle will transition to snow and blowing snow. Plan on slippery road conditions due to light ice accumulations. In addition, areas of poor visibility are possible. Total snow accumulations of 2 to 4 inches, with localized amounts up to 5 inches in west central Wisconsin. * WHERE...Portions of northwest and west central Wisconsin and south central and southeast Minnesota. * ADDITIONAL DETAILS...Winds gusting as high as 40 mph will cause areas of blowing and drifting snow. Cold wind chills as low as 25 below zero will cause frostbite in as little as 30 minutes to exposed skin. PRECAUTIONARY/PREPAREDNESS ACTIONS... A Winter Weather Advisory means that periods of snow, sleet or freezing rain will cause travel difficulties. Be prepared for slippery roads and limited visibilities, and use caution while driving. The latest road conditions for Minnesota can be found at 511mn.org and for Wisconsin at 511wi.gov, or by calling 5 1 1 in either state.